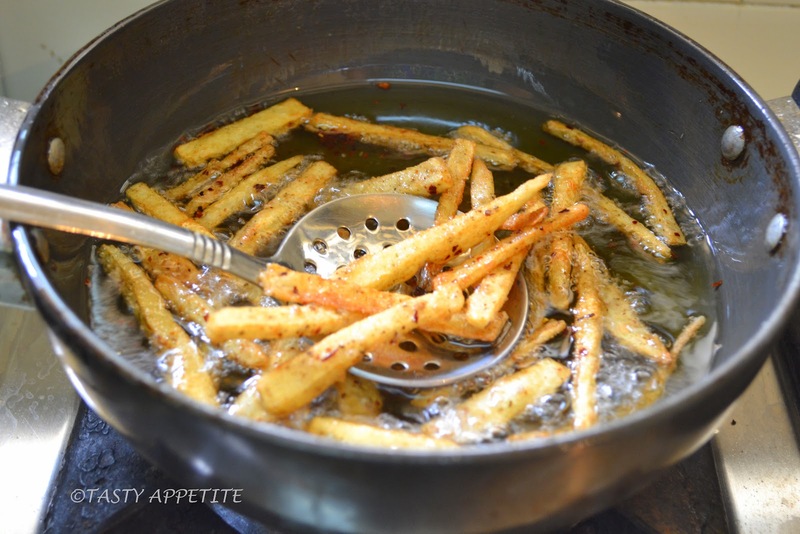 Here’s a quick & easy recipe to make awesome homemade Masala French Fries..!! 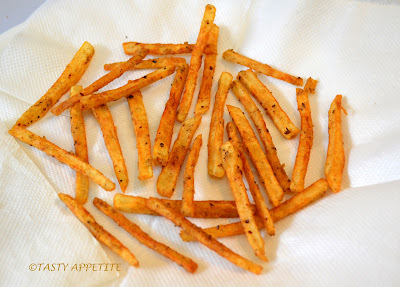 The taste of this thin, crispy snack is far superior to anything we find in local fast food chain’s ! They are great to serve with cool drinks or as an appetizer in parties & get-togethers..! 2. 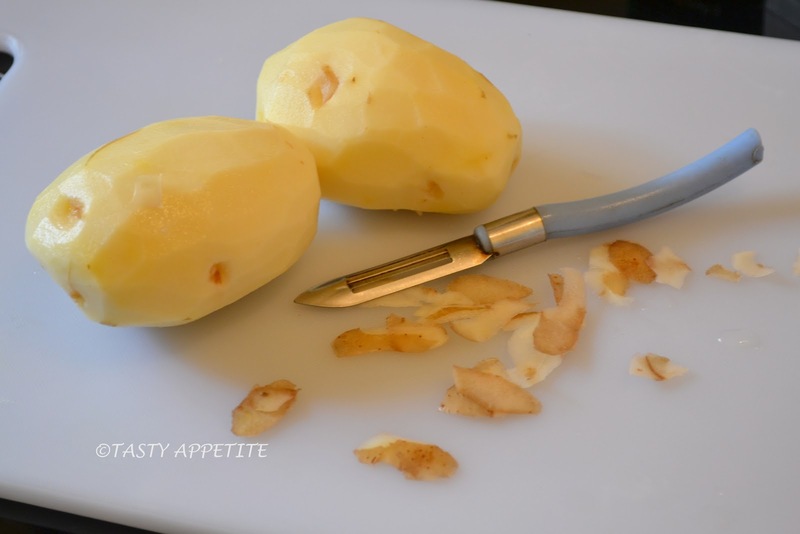 Slice the potato into thin, long pieces. 3. 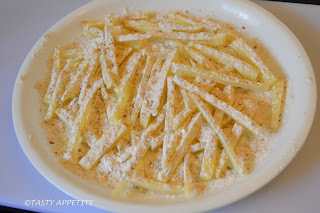 Sprinkle salt over it, mix well and let it rest for about 5 to 7 mins. 4. 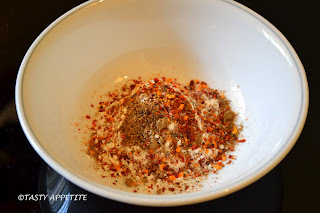 In a small bowl, prepare the masala spice mix with corn starch, salt, chaat masala pwd, red chilly flakes & black pepper pwd. 5. 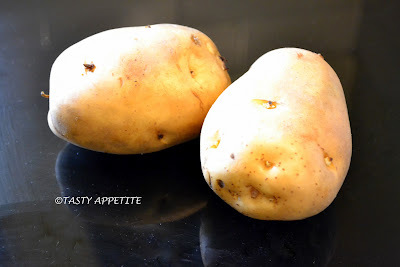 Now drain the salt water and dry the potatoes using a paper towel. 6. Place them in a wide plate and sprinkle the masala spice mix over it. 7. Mix well, so that all the pieces are well coated. 8. 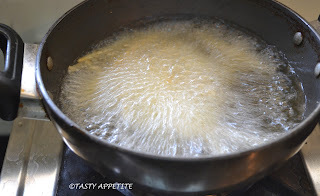 Heat the oil on medium flame in a frypan. 9. Add the coated potato strips in hot oil. 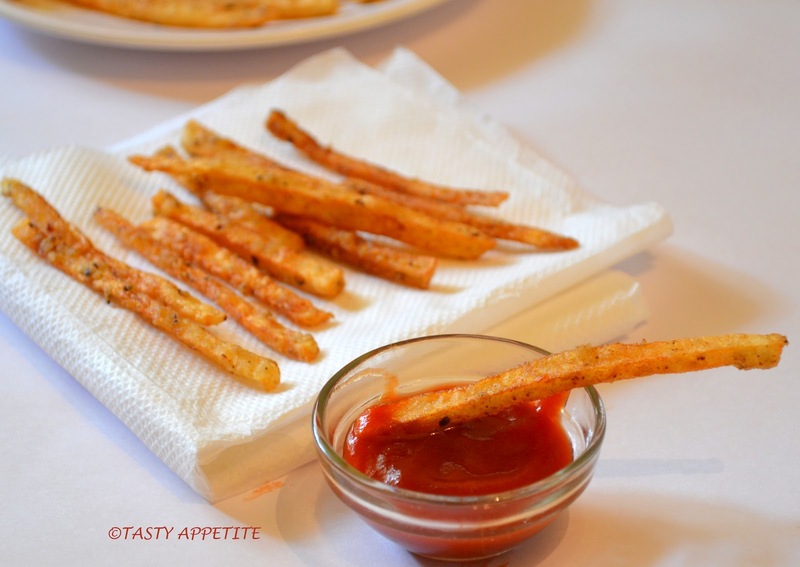 10.Deep fry them, until the French Fries turns light brown all around. 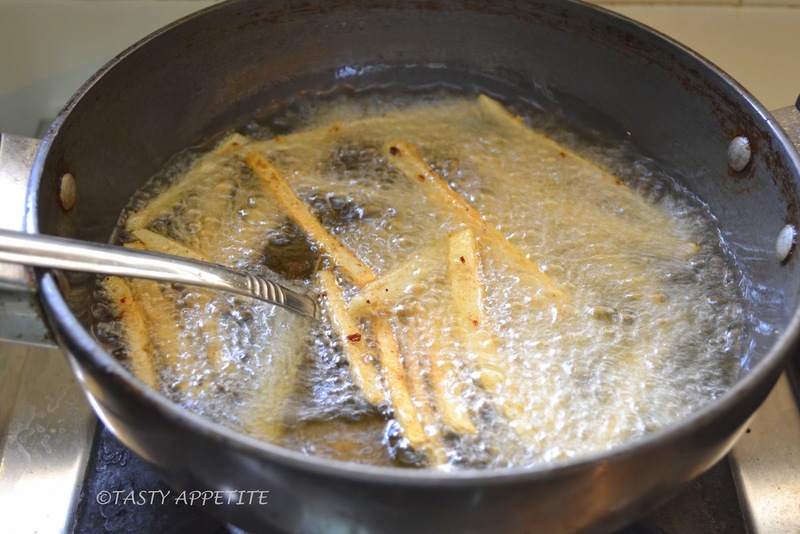 11.Remove the fries from oil and place on kitchen towel. Allow to cool for few minutes. 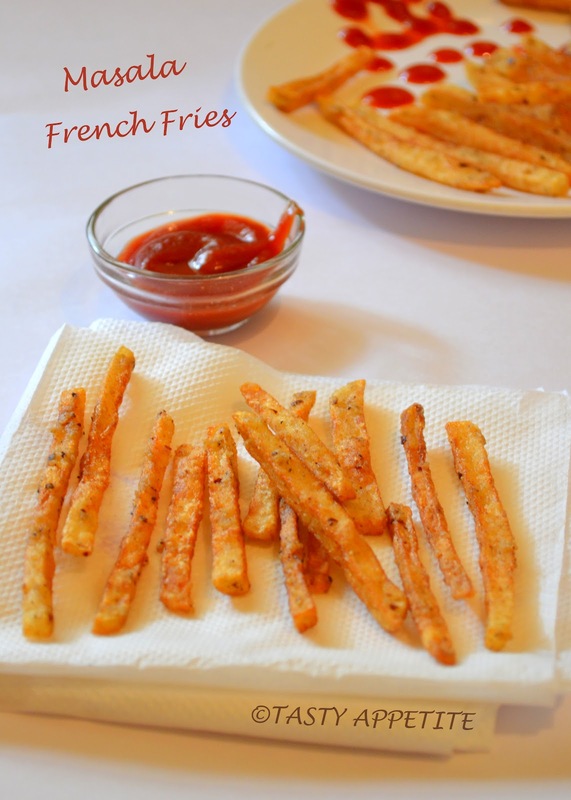 12.Serve, share & enjoy the yummy homemade Masala French Fries.! 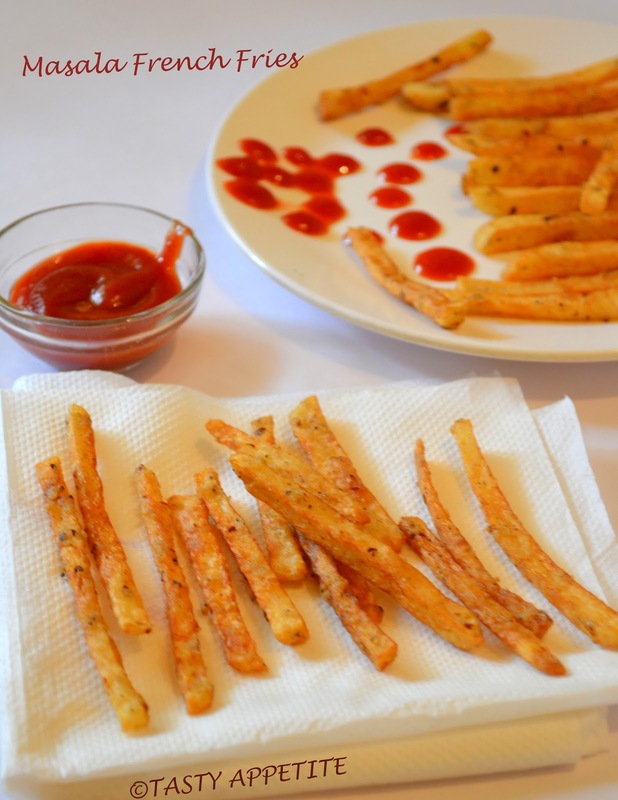 13.It makes a lipsmacking combo with tomato ketchup or with any dips ! yummy looking french fries, perfectly done...looks crispy and crunchy. 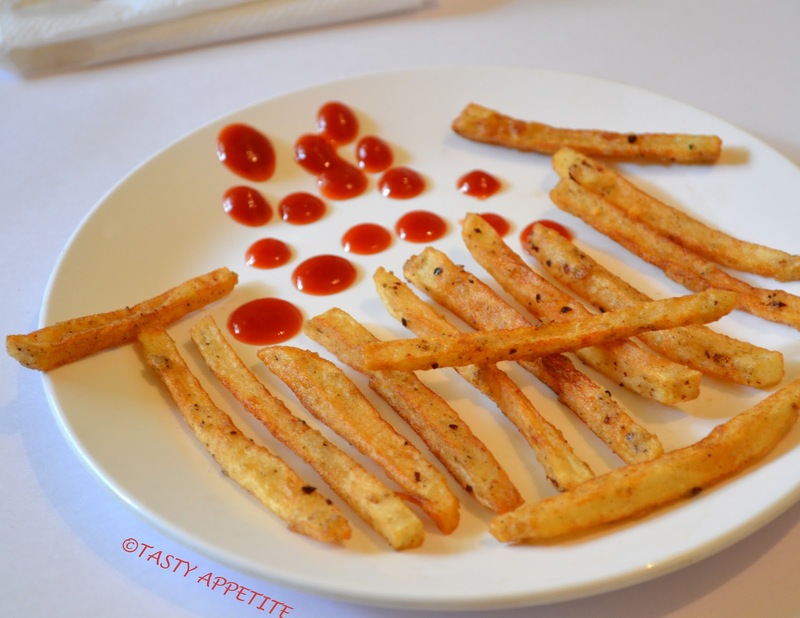 wow that is so tempting and nice variation to the regular fries!! Wow fries thoda hut ke. Good invention. Welcome back Jay..after a long time..nice n crispy..
WOW.....mouthwatering crispy french fries. Absolutely perfect one. Looks fabulous,yummy and super tempting, feel like having some. How have u been, my friend? Been quite a while. 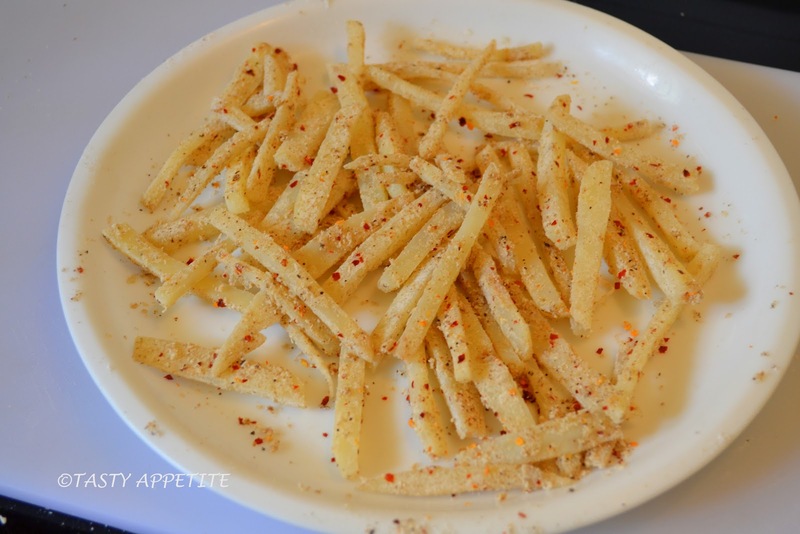 Well, your masala fries certainly caught my attention. Have a lovely weekend, Jay! 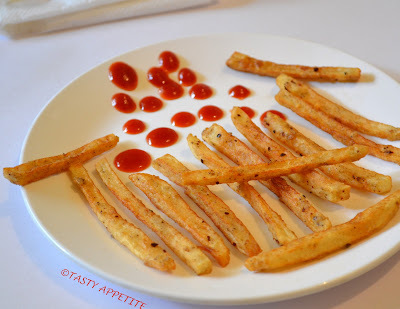 wow these fries look really crisp and with the masala twist absolutely yummy. 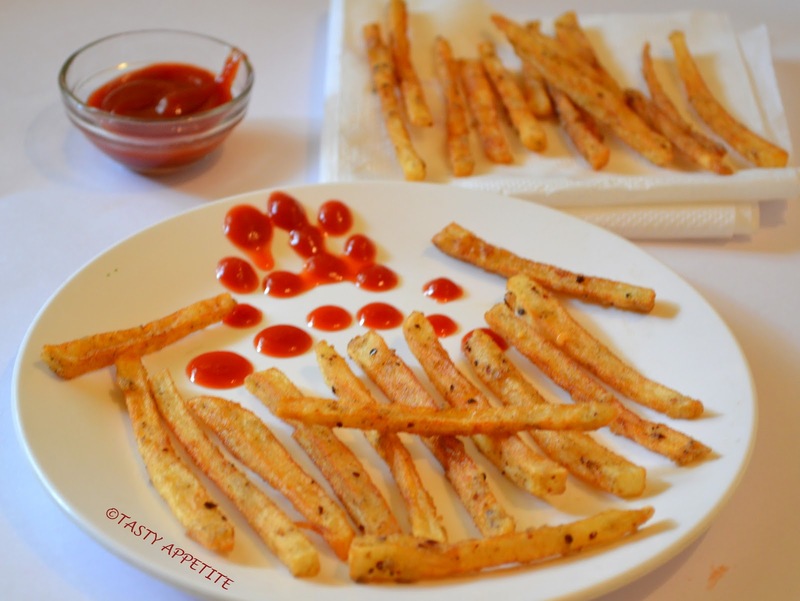 I could never get them crisp enough I think the trick is corn starch. Thanks will try this way. 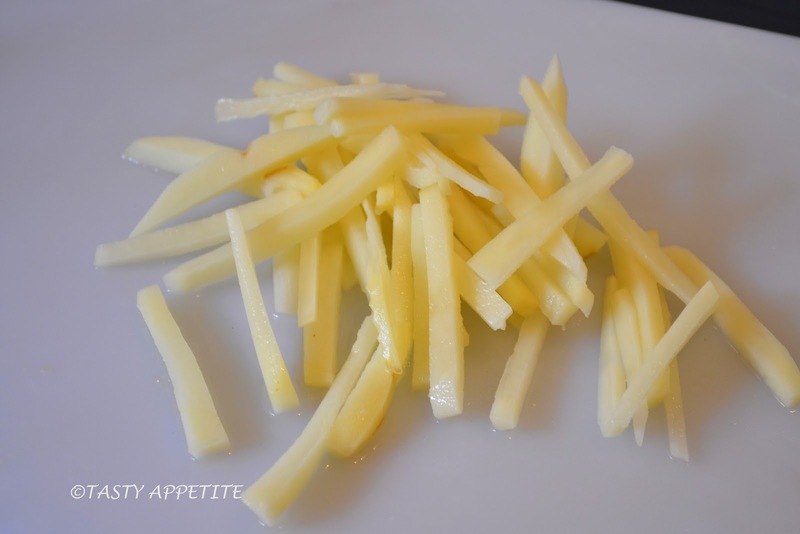 Perfect french fries, crispy and tasty! beautiful and yummy this dish Jay. You are very professional in the way you present your dishes! Gosh, these must taste tremendous! Love all the flavor you've added. Good stuff - thanks. Wow.. looks so yum Jay. Different from the usual french fries. Lovely post. Wow! 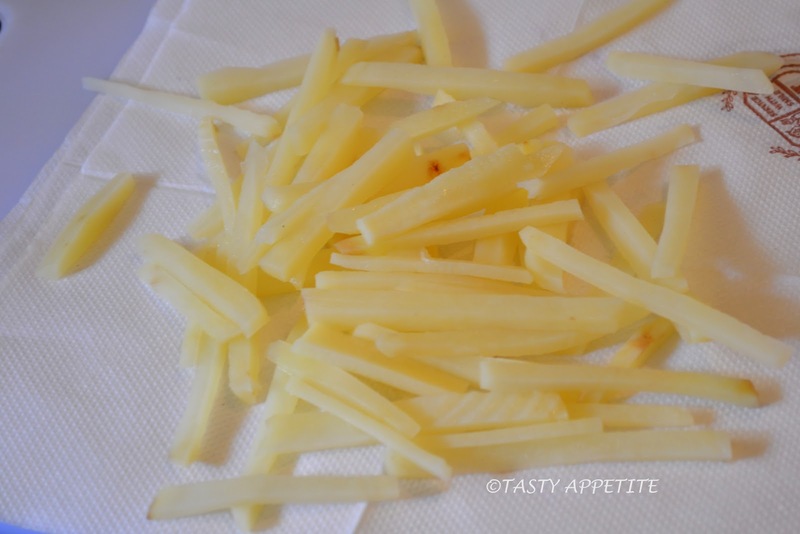 Nice Indian touch to the French Fries. Loved it! The fries look really great.Love the idea of adding the Indian chaat masala to the fries. 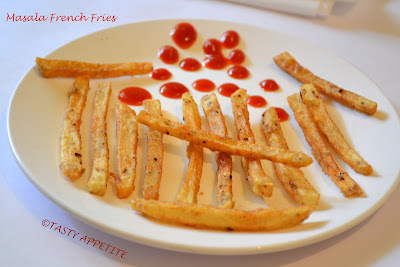 looks great than the regular one..
love to munch and crunch these crispy spicy french fries:)).. Perfect snack for me, especially for someone who just went through to an affordable dental implant. My dentist advises me to eat soft foods so that the recovery period will not be long. I could try this one besides, this looks yummy and sumptuous.